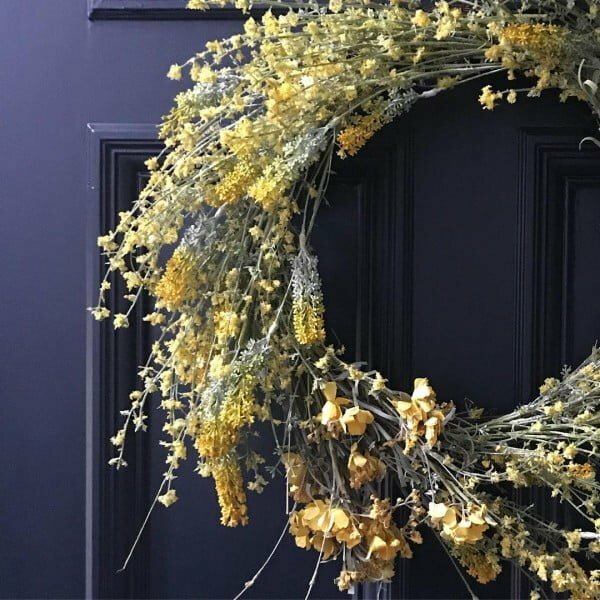 Want to make the most stunning spring wreath to decorate your home? Here are over 30 brilliant DIY ideas for your inspiration. 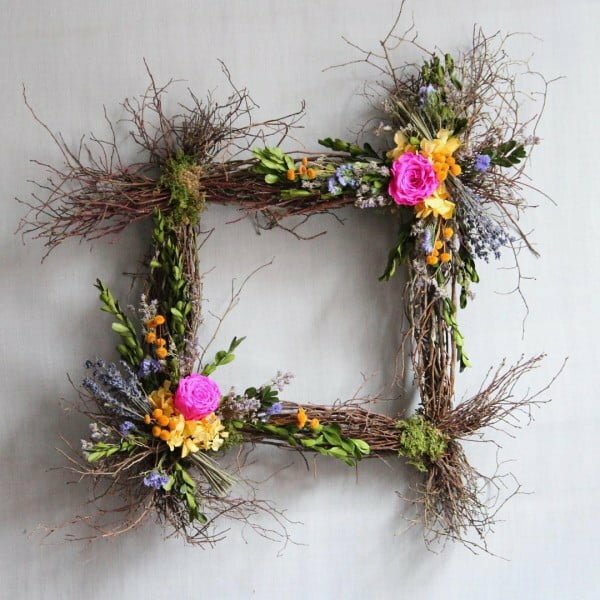 Wouldn’t you love to welcome in the spring season with a genuinely inspiring spring wreath? 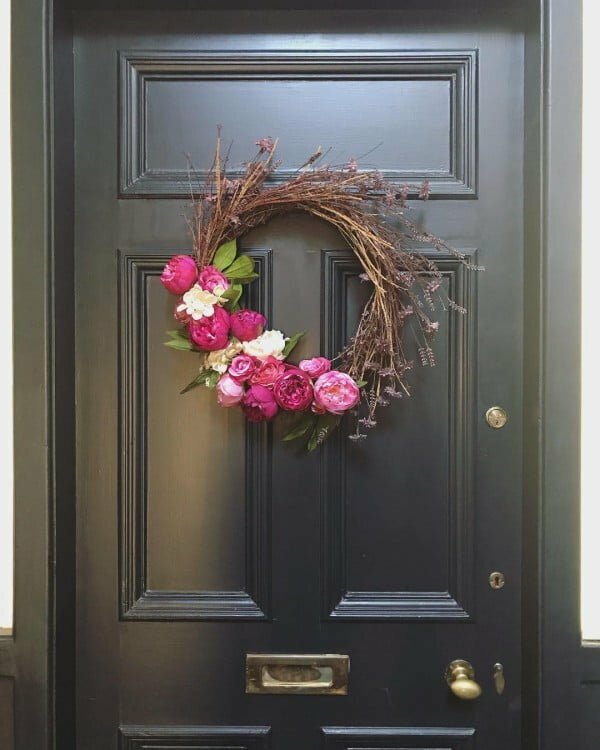 With some ingenuity and creativity, you can turn a drab front entrance into something special with a beautiful springtime wreath. 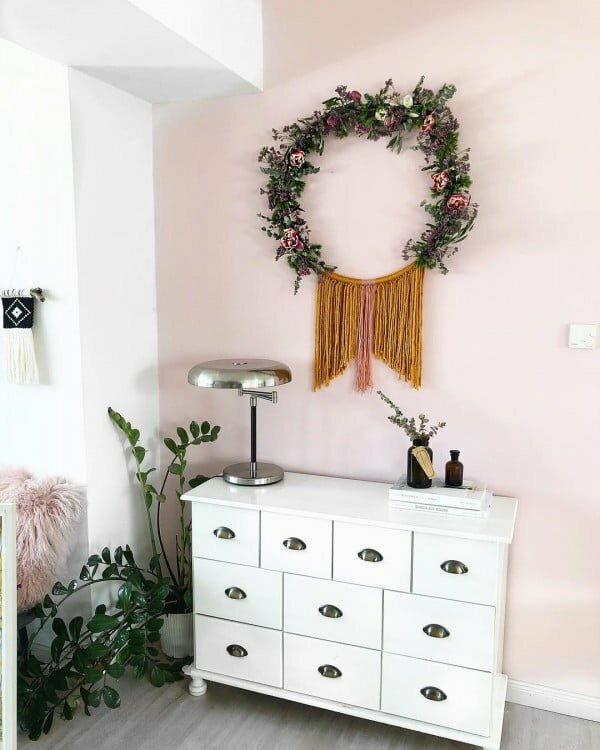 Whether you adorn it with flowers, baby animal figurines, pastel ribbons, or some essential greenery, it’s a look that you’re sure to love seeing whenever you leave or return to your home. 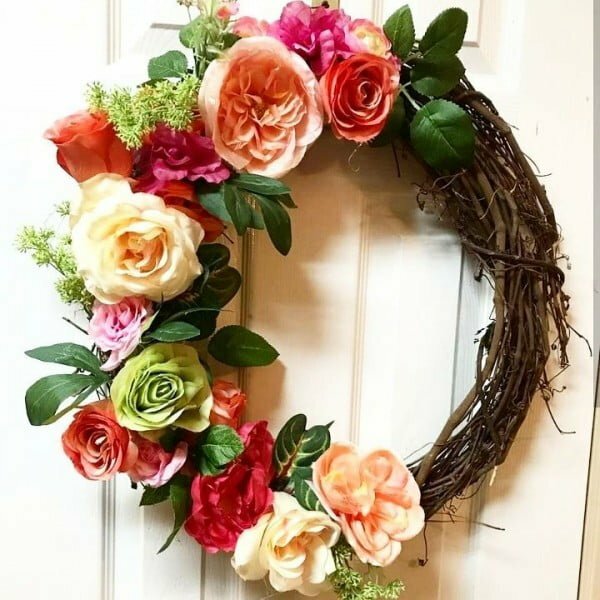 DIY wreaths are all the rage today. You don’t have to be a professional artist or craftsman to create what you see here. Take your time and be patient, and you will see some fantastic results. 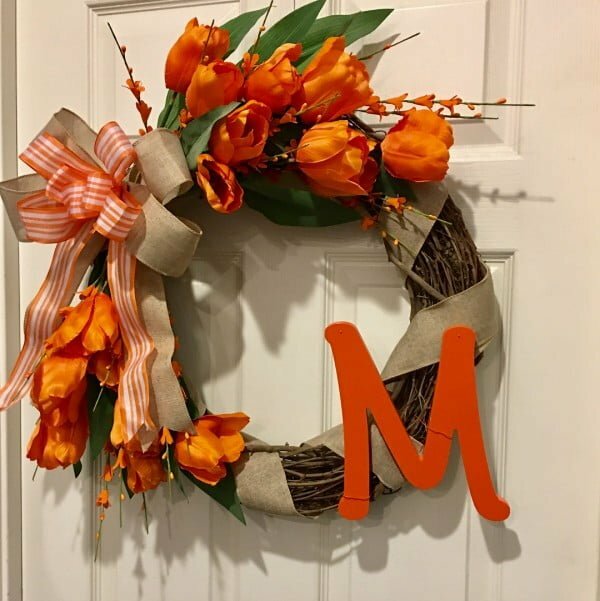 Other DIY wreaths: fall wreaths, Halloween wreaths, Christmas wreaths. 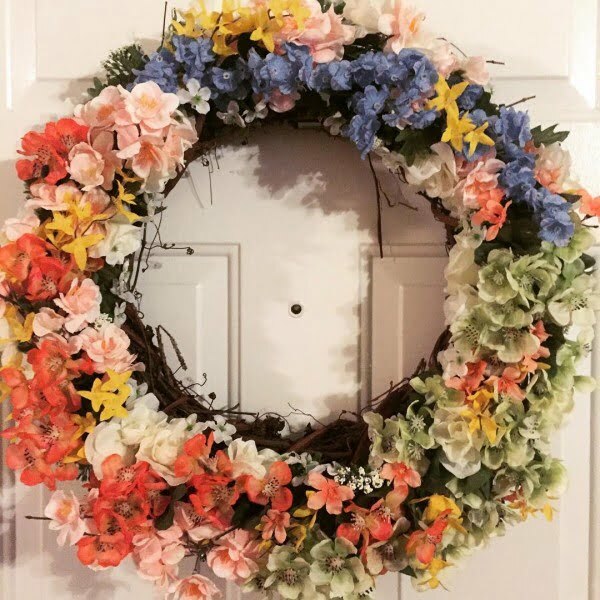 The bright colors in this wreath scream “spring.” Felt flowers give some unique dimension and are a soft touch compared to plastic or some other types of fabrics. Easter is coming up right around the corner! The vivid colors, including pastel blue, make this ideal for the occasion. 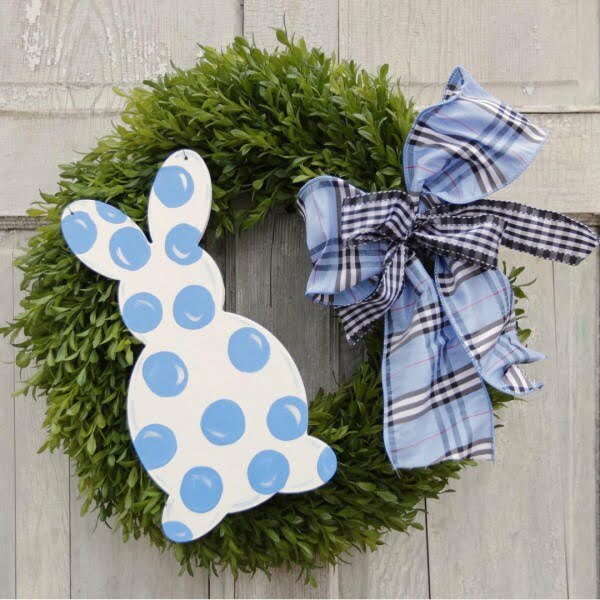 Welcome your family and friends into your home with an inviting Easter wreath. Do you absolutely adore embroidery? 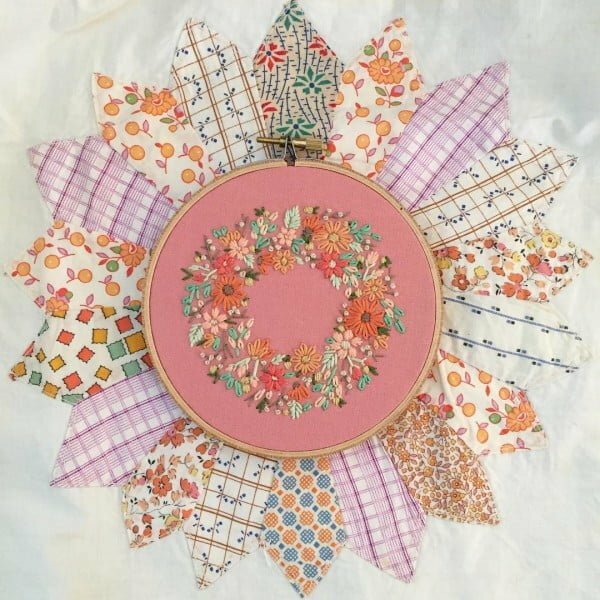 If so, this brightly colored wreath with fabric petals is sure to be a treasured decoration for your home. 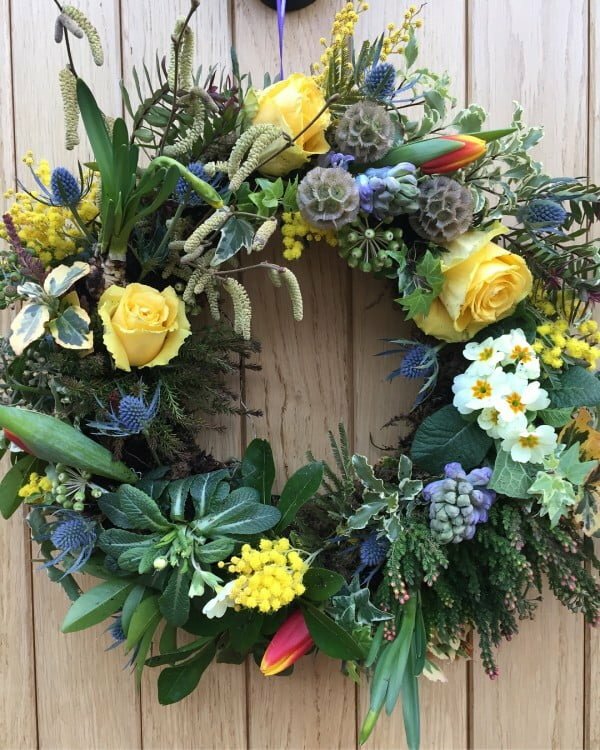 This living spring wreath features moss, ivy, heather, primula, and tete a tete. It will immediately evoke a feeling of spring being here already. 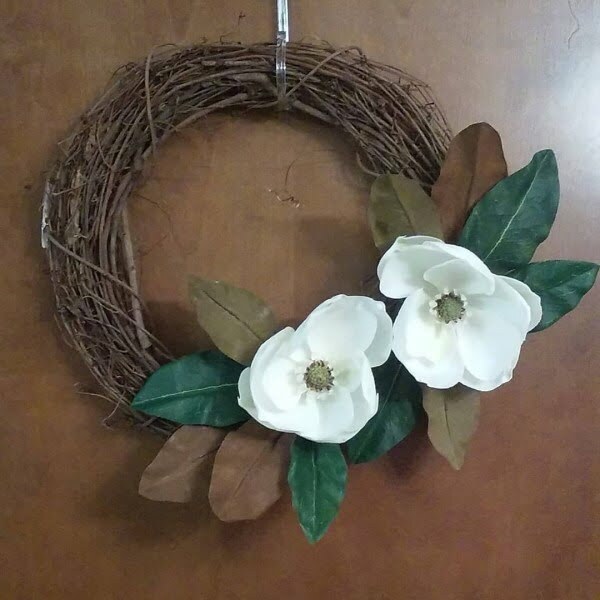 The open natural look is lovely in this wreath, complete with gorgeous giant magnolias. It’s a great addition to any front entrance. 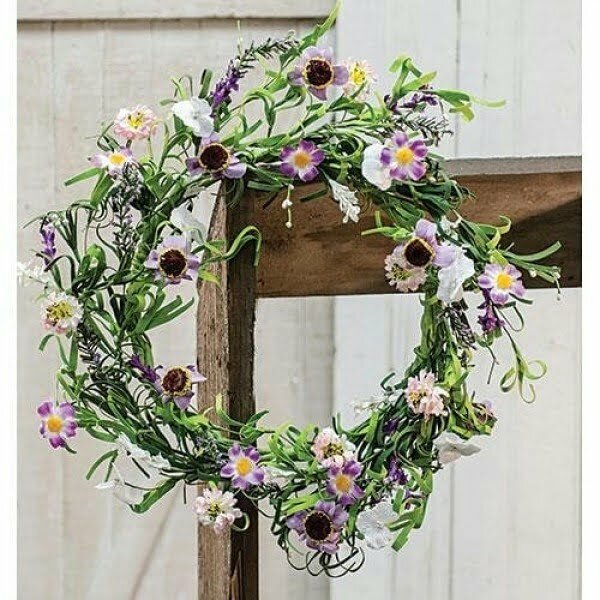 This wildflower wreath comes in at about 65 cm in diameter. It is full of yellow flowers in a perfectly angled pattern that you will love for spring. 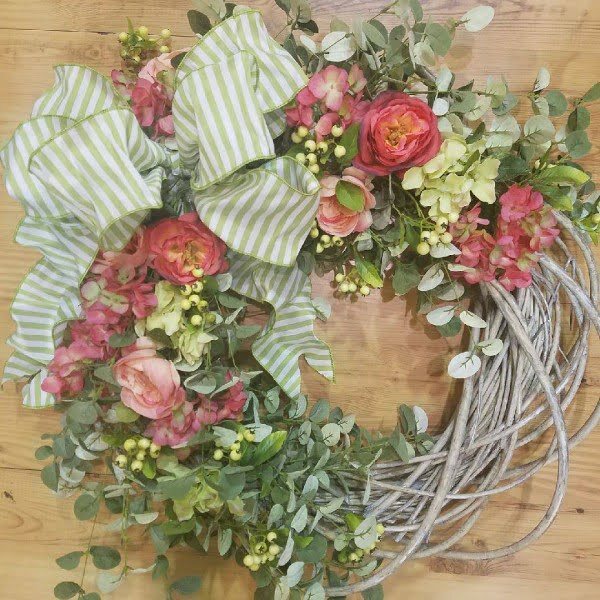 This floral wreath is a stylish and romantic one. 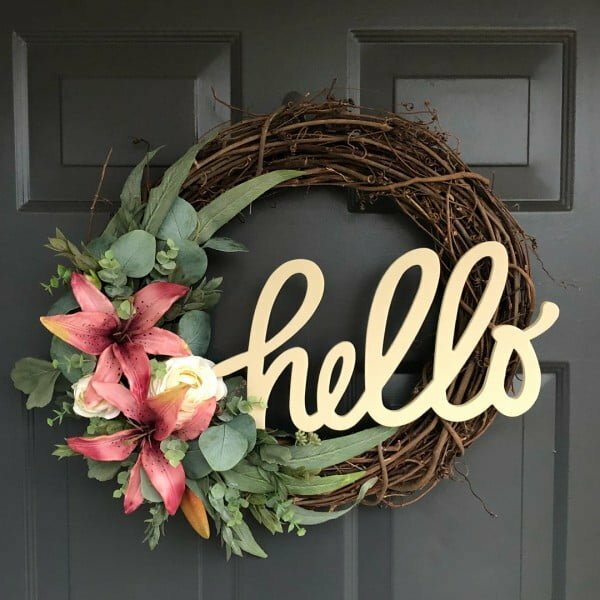 It is perfect for a newlywed’s home, as well as a young family who wants to decorate for Valentine’s day or an anniversary. 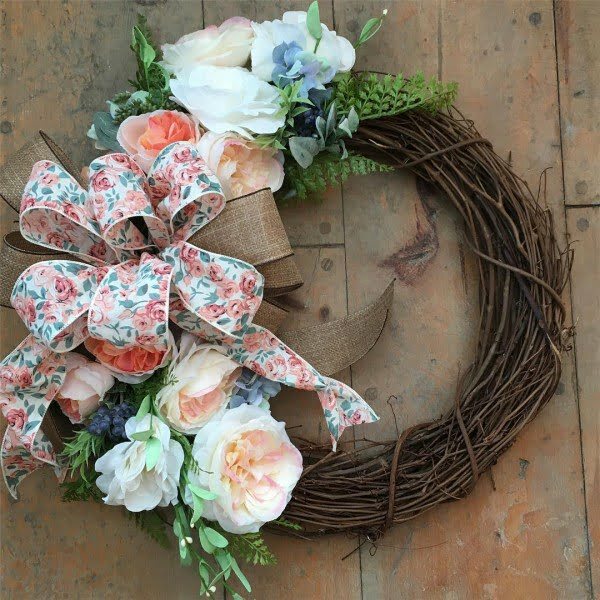 This burlap ribbon and pretty greenery is a great combination. The rustic look is perfect for a house out in the country – or a family that appreciates this style. Eucalyptus and bright pink flowers are a stylish blend to behold. The twigs may be on the dull side, but the way this is dressed up makes it enjoyable. 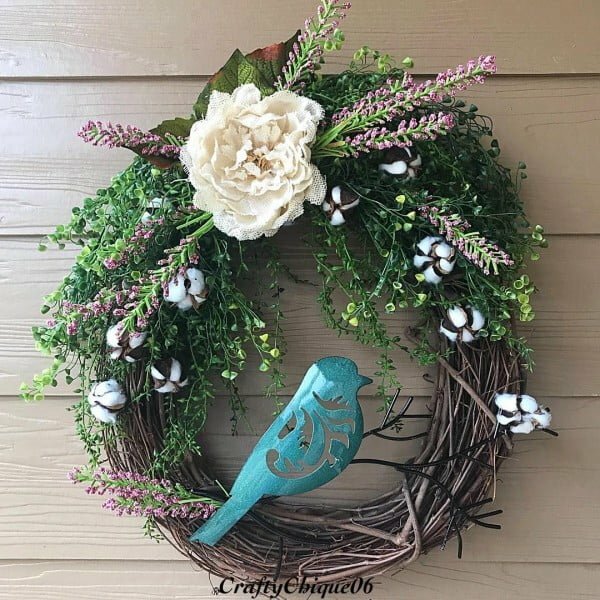 The bright and shiny bird in this wreath is sure to bring up your mood whenever you see it. The flowers are ideally placed as a beautiful frame for the bluebird. 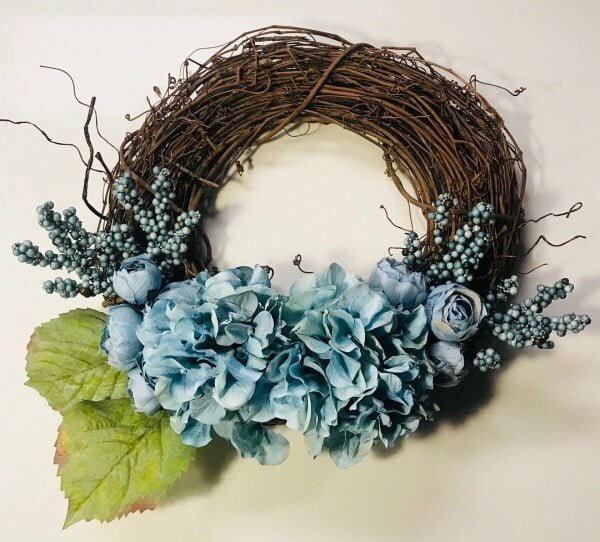 Light blue hydrangeas and subtle greenery make for a great simple wreath to adorn your front door and have you thinking springtime thoughts. 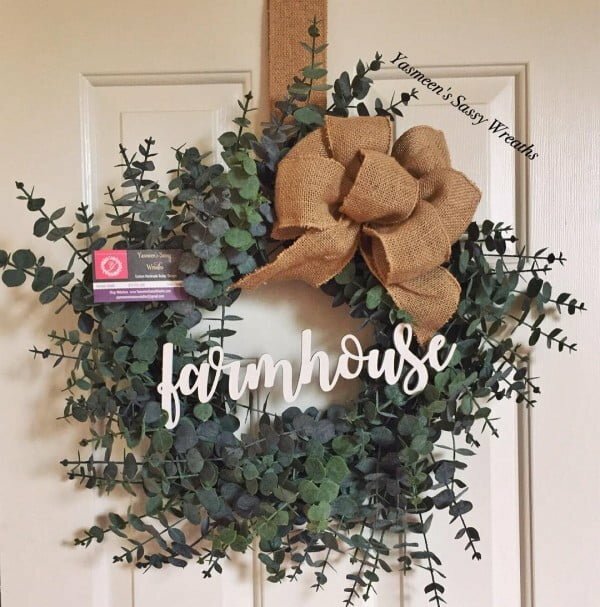 We heard it through the grapevine that you would want this wreath! Its bright orange-hued flowers over grapevine base make it a gorgeous sight for your guests. The vivid hues in yellow, pink, and white make this ideal for the season, especially for Easter. The flowers contrast well with the dark frame. 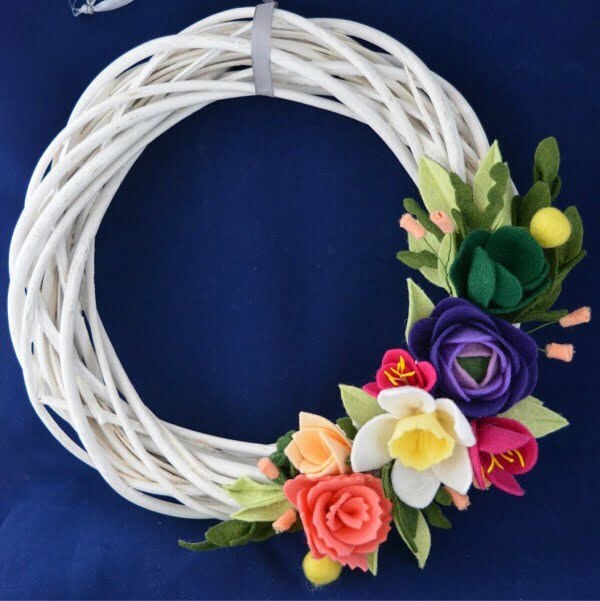 Another wreath with felt flowers shows just why this is a significant trend. You will love the textured look, including the many hues of the flowers. 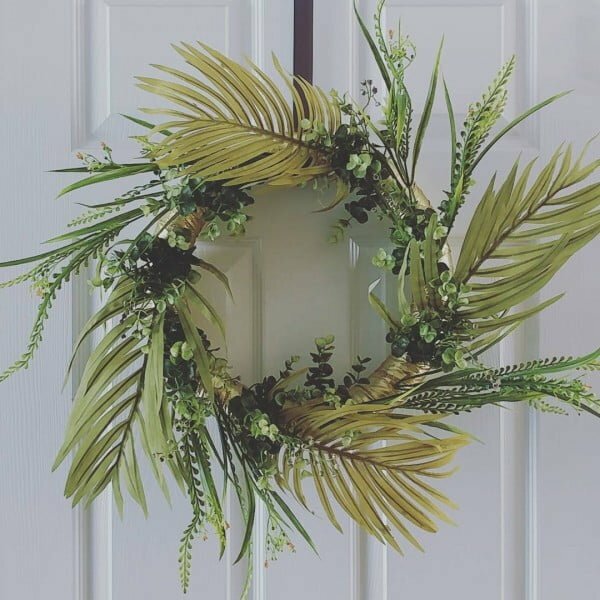 It is a classic wreath with a modern appeal. 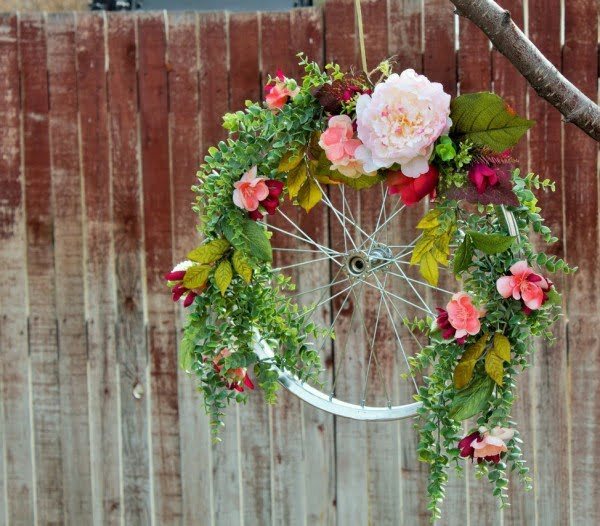 This wreath has a unique twist – it is crafted from an old bike wheel! Upcycle your bicycle into something you will get to see on a daily basis, admiring your craftsmanship. 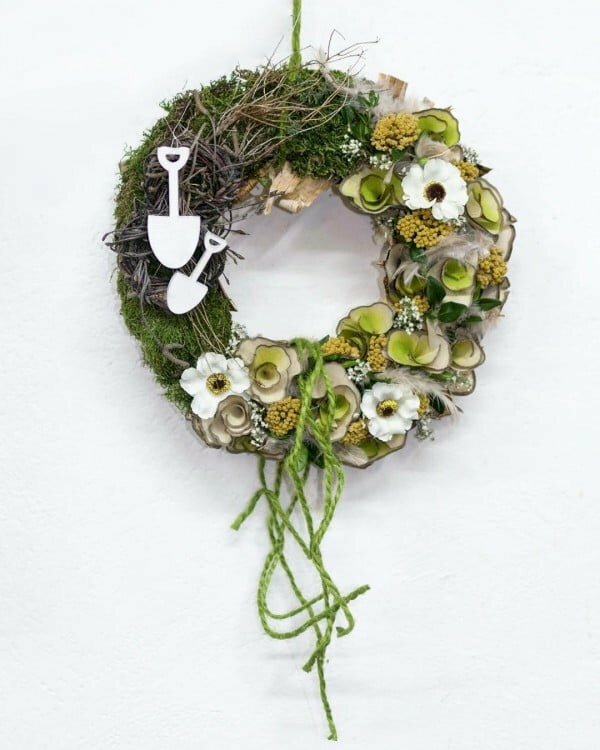 This wreath adds a delightful sense of humor beyond the sometimes serious nature of tradition. The use of child’s boots and big bows provides a welcome whimsical twist beyond the ordinary. 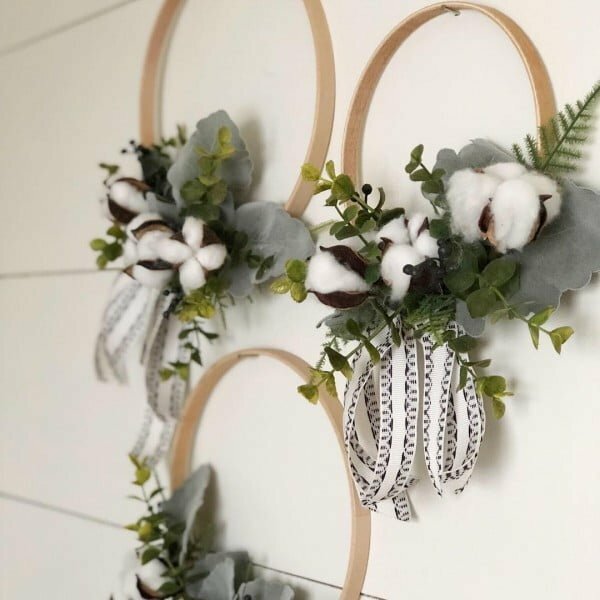 This small lamb’s ear leaf wreath accomplishes beauty on a budget. The gentle pastels of the four flowers match delightfully with the velvety nature of the circle of muted sage green leaves. 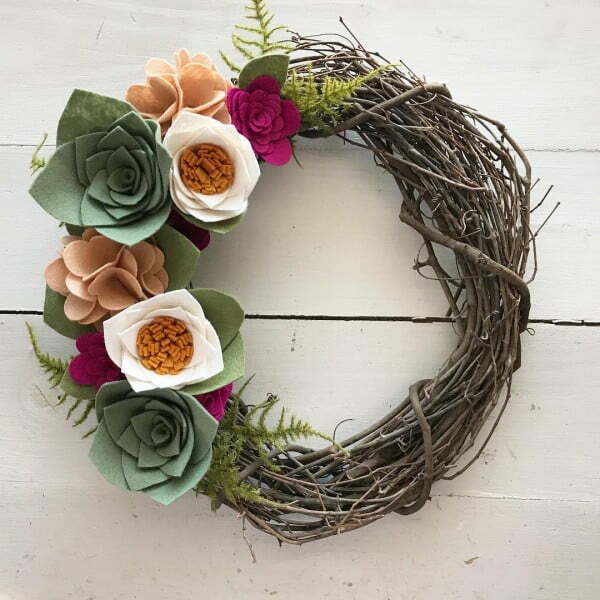 This wreath reminds us to not limit ourselves to traditional sizes or patterns. The rich hunter green weave can add a splash of color and nature to any size room or door. This design promotes consistency to sooth. 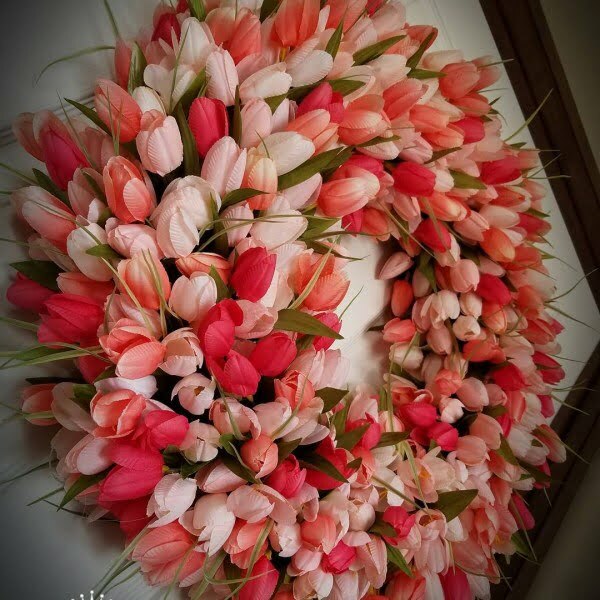 Pink shades of the faux pastel tulips lend a feel of infinity to the floral circle. Summer comfort and joy can be achieved through simplicity. This design captivates by tastefully pushing boundaries on its opposite sides. Consistent browns of the upper weave enhance the impact of the pink bouquet of faux roses on the opposite side. 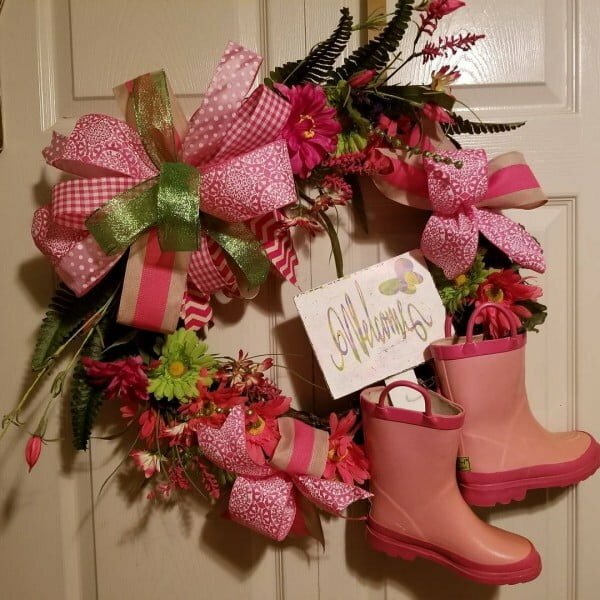 This design shows that taking chances can result in unique and striking wreaths. The neutral tassels of varying length provide a fascinating foundation for the for the vault pattern of greenery above. 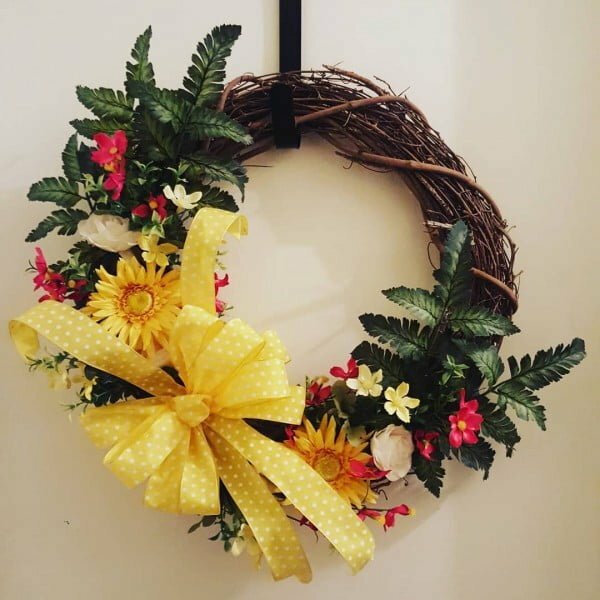 This design demonstrates that wreaths need not contain dozens of pieces to glow with artistic beauty. Balanced with leaves of green, this grapevine wreath leaves a wonderful vivid impression. 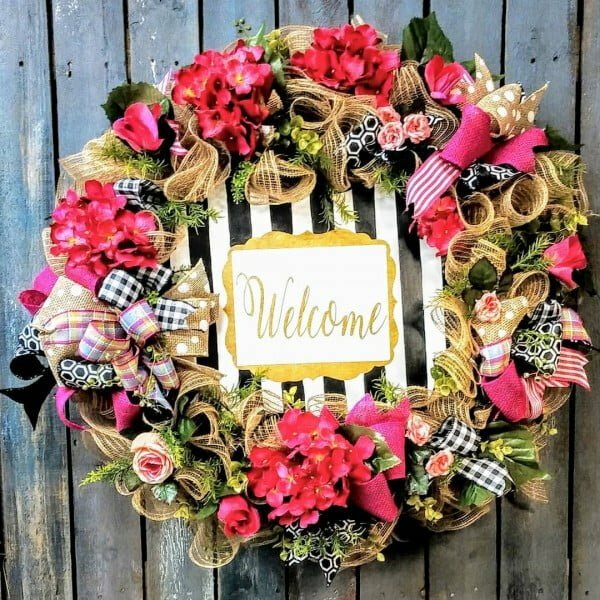 This fantastic “welcome” wreath clearly shows that well-chosen ribbons look great with the larger fabric used as backing. The astounding detail that is accomplished with ribbon and lace is inspiring. 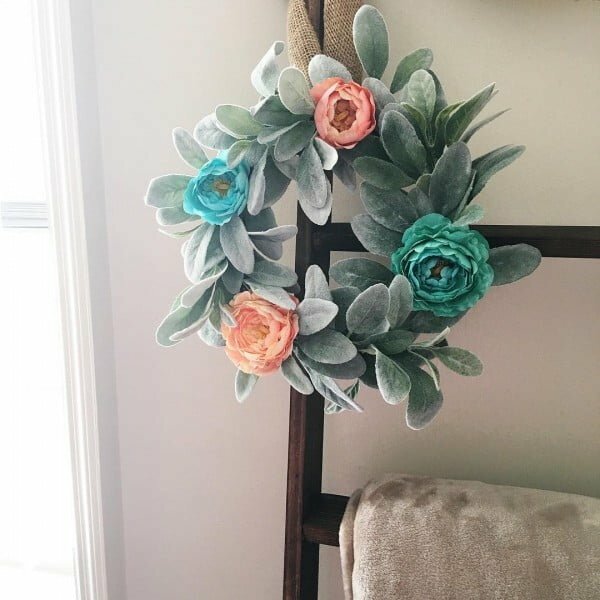 This unique wreath cluster is a reminder that possibilities are as unlimited as your imagination. This pairing of cotton, bows and wood circles shows that with the right pairing, simple can be stunning. 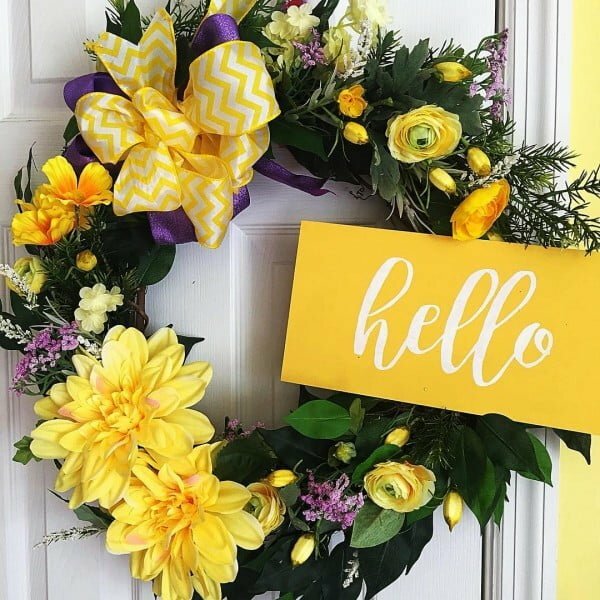 A pair of gorgeous vibrant Easter Lilies emphasizes the classy yellow “hello” on this grapevine wreath. The smooth arrangement around the lilies including roses gives this joyous circle year-round versatility. From the floral bow to the splashes of colors on the big with flowers, this design invites the Spring. 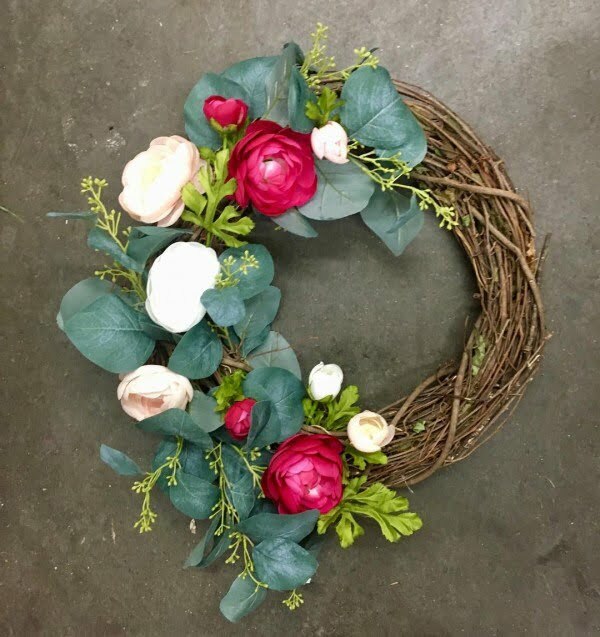 This grapevine wreath will greet the guests to your home with lasting joy. This design demonstrates that by allowing enough width, you can twist similarly colored smaller flowers throughout the circle to give the illusion of dance. Intriguing floral waves are easily formed. 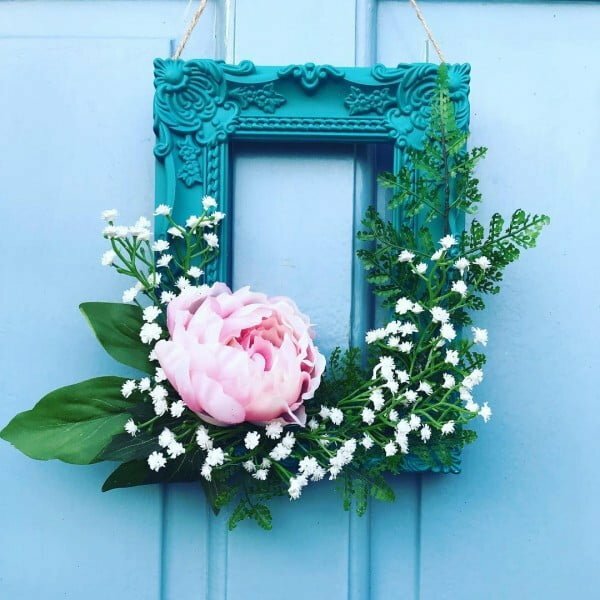 An artful turquoise colored frame wreath would add sparkle to your front door with its classy artful details. The large soft-pink flower and surrounding arrangement are perfectly paired with a touch of fun. The flowing design of subtle pinks and greens would blend with your drapery and furniture as naturally as possible. The attractive draped design would also add classiness to your front door. 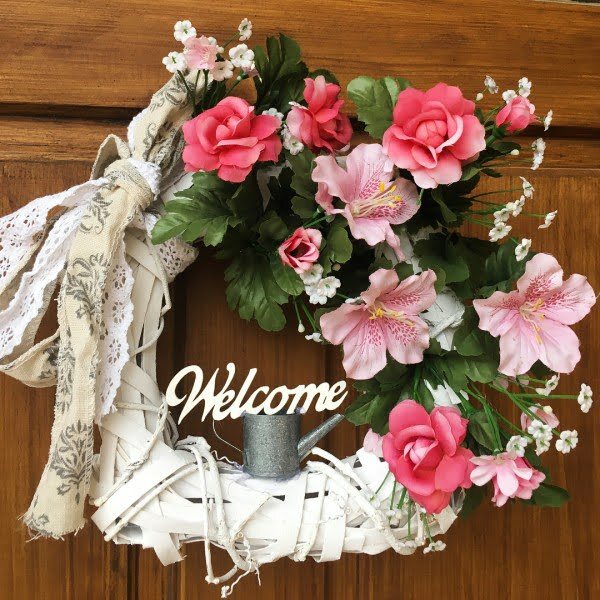 A door wreath like this design would make your loved ones feel cherished when they arrive at your house. Big bold, beautiful yellows would greet your guests with flowers, bows and a hug. Nothing says spring more than purple pastel flowers. Lilacs, pink daisies, and gentle white flowers surround the green circle in nature’s full bloom to fill your house with warmth. 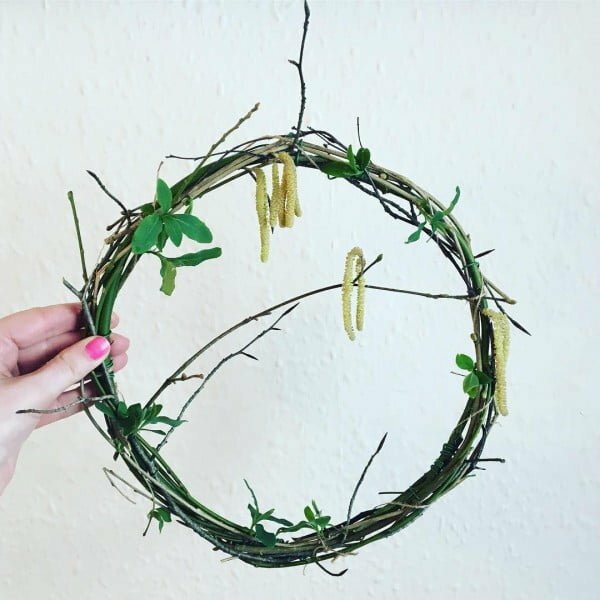 From sage green to jade, this lovely wreath displays all the greens nature has to offer with elegance. Fans of movement spring forth in a green spectrum from the twine wrapping. This unique square design balances the simplicity of twigs with two bursts of fuchsia roses. Surrounding the two roses is a subtle rainbow of flowing flowers that support each pink passion. This lush circle of natural green will hint at your beautiful outside garden. From seed to full bloom you can feel the dreamy energy of flowers through their entire cycle.